The 2018-2019 Thangles Block of the Month is called "Shattered". It is a five-month program, October 2018 - February 2019. Each month's kit will consist of five different 2 3/4" strips. Each kit will make one "Row" of the quilt which is ten blocks. (Background sold separately). We have two color options - Scrapp or Batik. You can choose to make one or both. 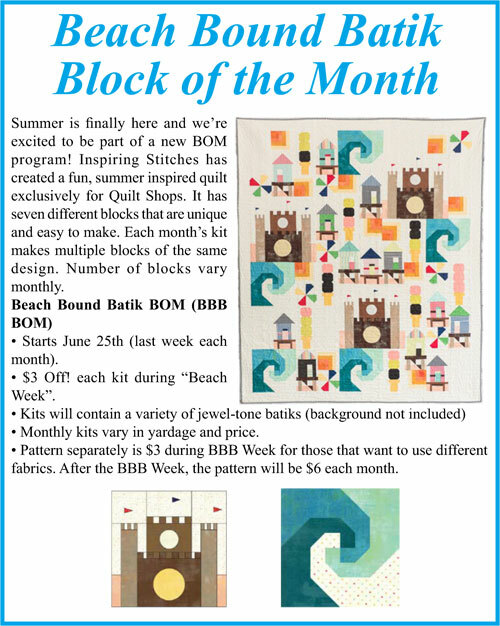 The Month 1 kit includes the fabric, the pattern and all the Thangles needed for the entire quilt for $20. Months 2-5 kits contain the fabric for that month's row. If you come into the store during "Thangles Week" you can purchase one kit of each color for $5. Additional kits are $6. After "Thangles Week" kits are $8 each. We guarantee to have each month's kit available through the end of that month. Kits will only be available after that month as supplies last. 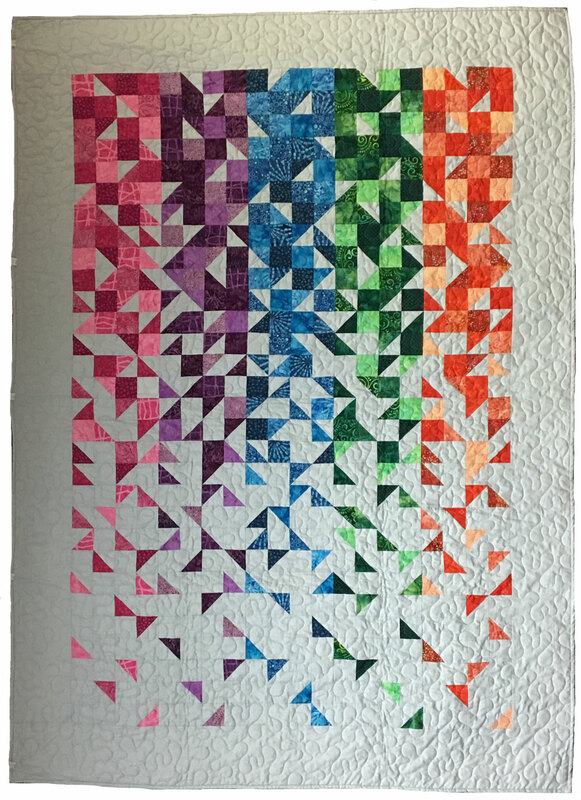 The Scrappy quilt finishes at approximately 62" x 85" with a mitered border. The Batik quilt finishes at approximately 57" x 80". to learn more about the following quilts and projects. 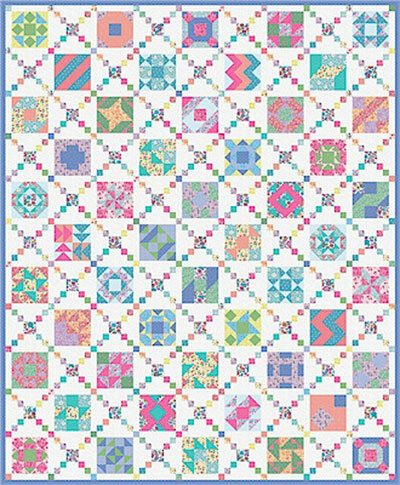 Mrs. Miller’s Apprentice features sampler blocks in a traditional setting. 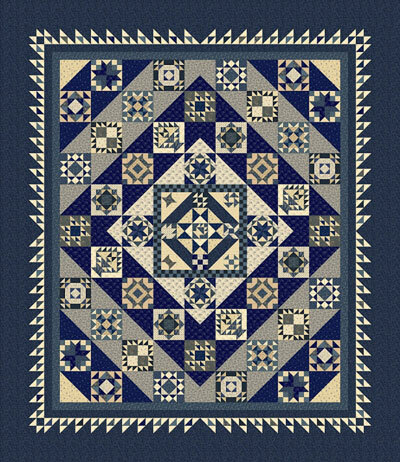 It features a selection of light and dark blue prints in various shades to give sparkle to the quilt. 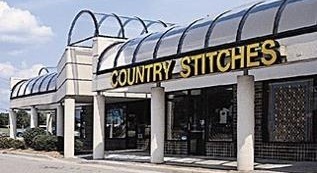 There are 27 different fabrics for your piecing pleasure! All of the fabrics are historic reproductions. Not a beginner quilt. Lots of small pieces. Call now to purchase. $10 Non-refundable Registration fee. Monthly Kit Fee: $25. The quilt finishes at approximately 77” x 89”. Pattern & Fabric designed by Pam Buda. Flowers of all shapes and colors always seem to have magical powers to lift one’s spirits... With its mix of bright, vibrant blooms and subtly shaded petals, the Prettiful Posies collection used in “Posies Puzzles” celebrates the delight of exploring a neighborhood garden on a summer day. Each month, you’ll make pairs of blocks. 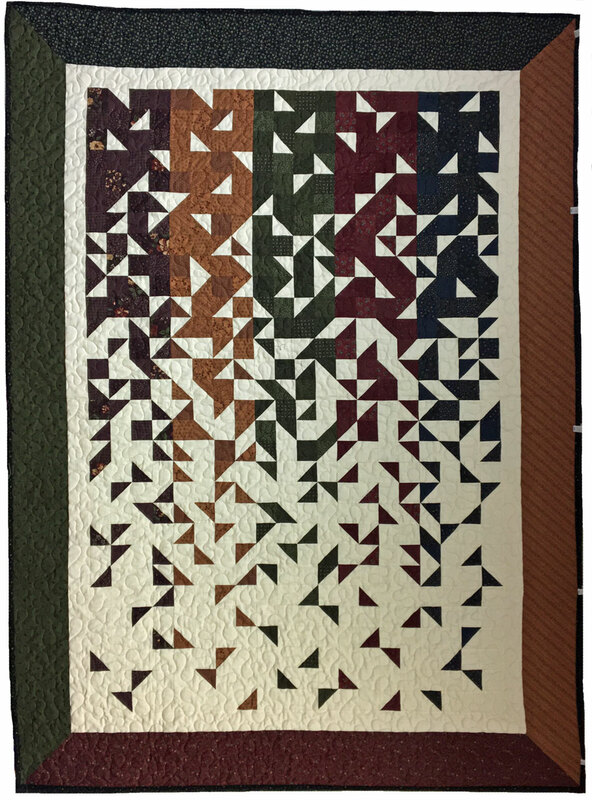 Each pair will feature the same fabric in different arrangements so once the quilt is assembled, the puzzle becomes finding the blocks that match. Only 20 kits available. Call now to purchase. $10 Non-refundable Registration fee. Monthly Kit Fee: $25. The quilt finishes at approximately 80” x 98”. Pattern & Fabric designed by Sarah J. Maxwell. 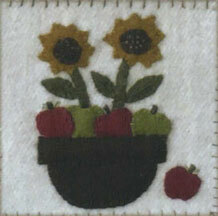 This cheery, colorful sampler style appliqué design is suitable for all skill levels. 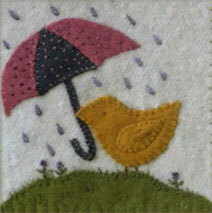 The instructions include diagrams for basic embroidery stitches, so even beginners can do it! 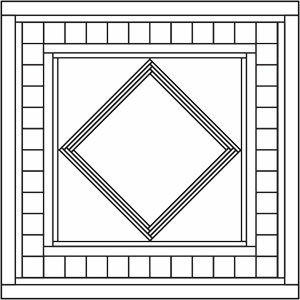 The blocks are created from premium Marcus Wool 10” x 10” Precuts! We are using cream wool for the background but you can choose whatever background you would like. You can even use a variety of backgrounds and display each individually. The pattern includes various finishing options for multiple project choices. 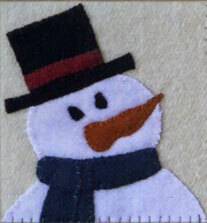 Kit includes pattern, wool for appliqué and threads to match the wool. Only 20 kits available. Call and pay today! Fee: $5 Non-refundable Registration Fee and $10 per month for 12 months or pay all now and get two months free! (1/2 yard background fabric not included) Finished 18" x 24", Each block is 6" square. We can only reveal the outline of this quilt since it’s a mystery. Sign up for the Kick Off at either location and see the finished quilt at classtime. During class we’ll go over how you can get 1/2 off blocks each month. Finished quilt measures 80" x 98".